I LOVE this recipe! It’s packed full of flavor and my house smelled amazing while it cooked. My husband made it, and he’s a “novice” cook, and it was SO easy for him to make! I thought there was going to be too much garlic, since I usually only like a little bit, but I was totally wrong. Thanks, Lisa, for a delicious easy meal! 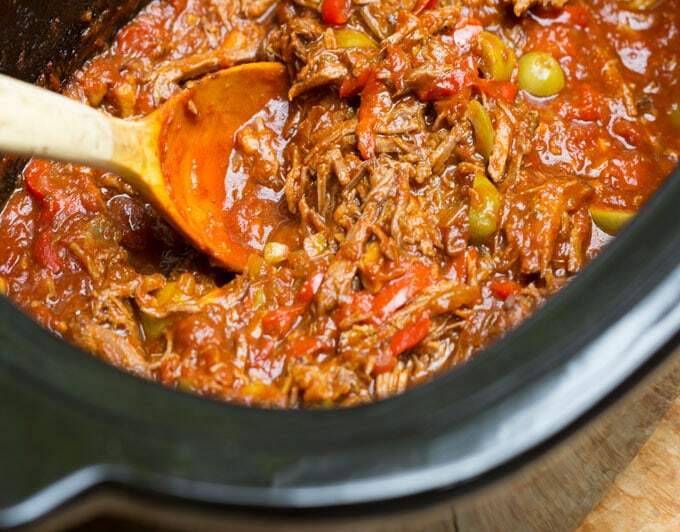 Cuban style Ropa Vieja is great. So are the Mexico City and Tijuana and the East L.A. versions. A few hints that work for my wife and I. Our Nom de Plume is PatRon. Cut the beef in large chunks for browning. And cut back a touch on the tomatoes. Used stuffed olives and a Tbsp. of olive brine works wonders and it’s free. We have just started following your blog. Good luck. Woah! This was great! 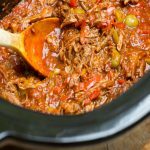 This recipe is a little more detailed than my old ropa vieja recipe, but the extra time and extra ingredients were more than worth it. Thanks so much for this. I try to use my crockpot once a week in order to have meal that is already prepared when I get home. This came out perfect! Looking at the reviews I notice people have been making this stew and raving about it for years. I am sorry I didn’t make note of your quick black bean recipe. My husband and I would have loved them. We will wind up with plenty of leftover. I plan to freeze them and make the beans with the dinner next time. Made this yesterday and it was a big hit. Served it with black beans with jalapeno/lime and a brown jasmati rice. The dish worked well in the slow cooker, but nect time I might try to adapt it for my instant pot. The recipe has a permanent place in my recipe file folder. Do you have to cool everything first on the stove? 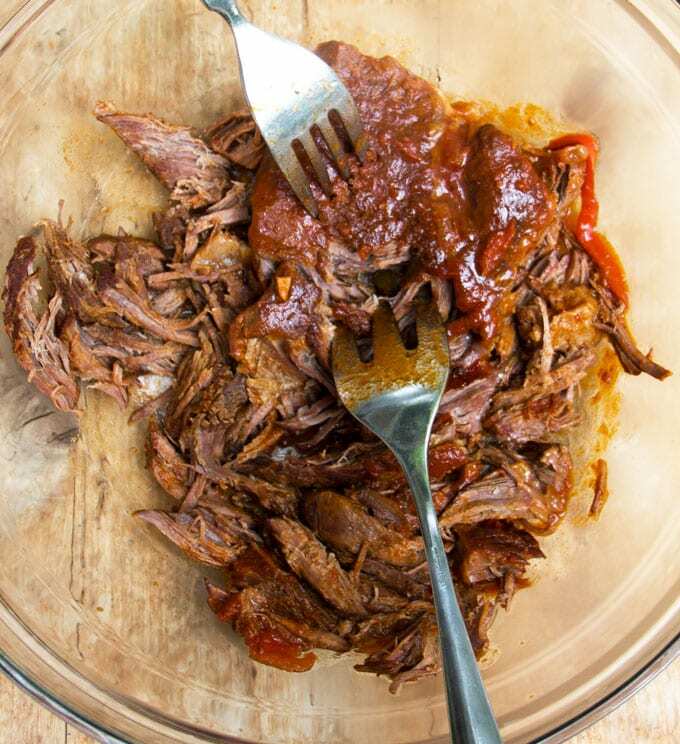 What happens if you just throw everything in the crock pot without browning the meat or caramelizing the veggies? That’s a great question. I’ve never tried just throwing it all in. I’d be very curious to know how good that is. 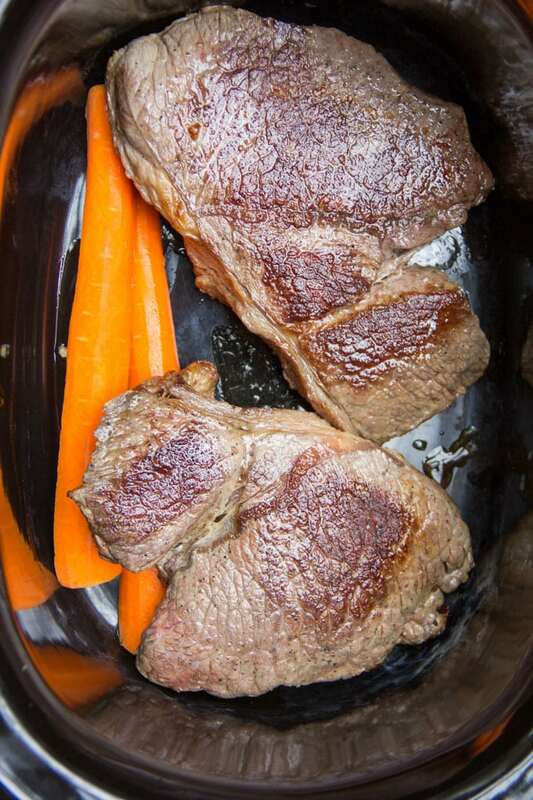 I find that searing the meat first helps seal in the juices so the meat gets nice and tender. Browning the meat and the veggies also adds another layer of flavor to a dish. But I wonder if the dish would still be delicious without all that extra effort. Please let me know how it turns out if you decide to give that a try. This looks really good. Do you think I can half the recipe and it still come out good? I know sometimes the liquids are needed. Kathy, I think it will be fine. The slow cooking will tenderize the meat and there will be plenty of sauce. Let me know how it turns out! Hi Oliwia, you should have great results in the oven. I wait until the stew is done and the meat is extremely tender. Then I pull it apart easily using two forks. You can either do it in the pot or put it on a cutting board to shred it. If the carrot doesn’t fall apart while cooking, you can cut it up if you like. It’ll be delicious but it’s mostly in there to add flavor. 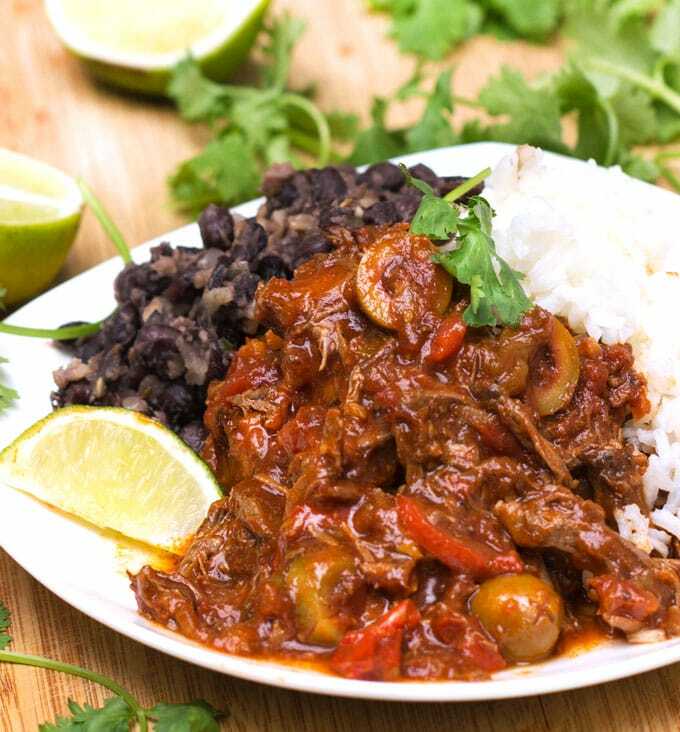 I hope you enjoy the ropa vieja! Hi! Going to try this out over the weekend. A couple of questions: at what point do you shred the beef? Also do you discard the carrot halves – or do they break up into the sauce? Hi John! 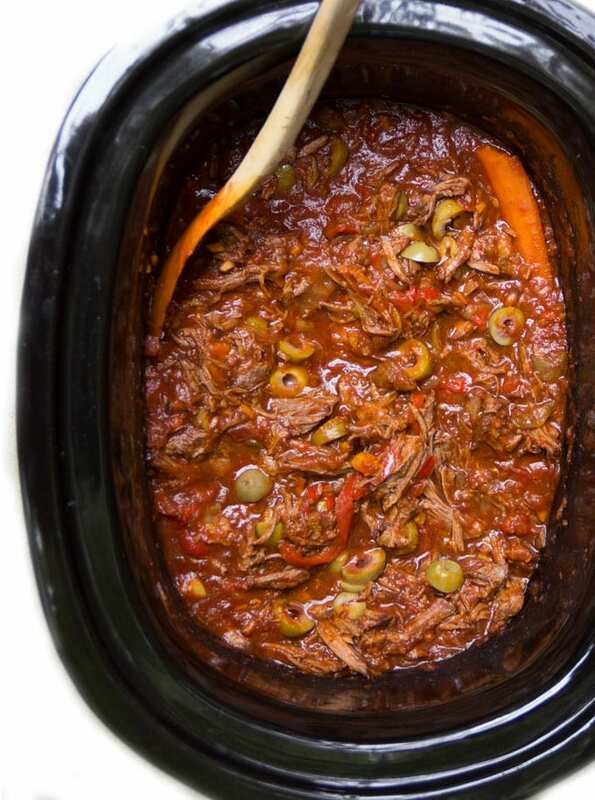 Good questions – when you turn off the slow cooker give the stew a stir. The meat should fall apart easily. You can shred it more, if you like. I usually do that right in the pot with two forks. By the time the stew is done, the carrots are delicious and tender so you can either leave them as is or break them up or slice them to your liking. 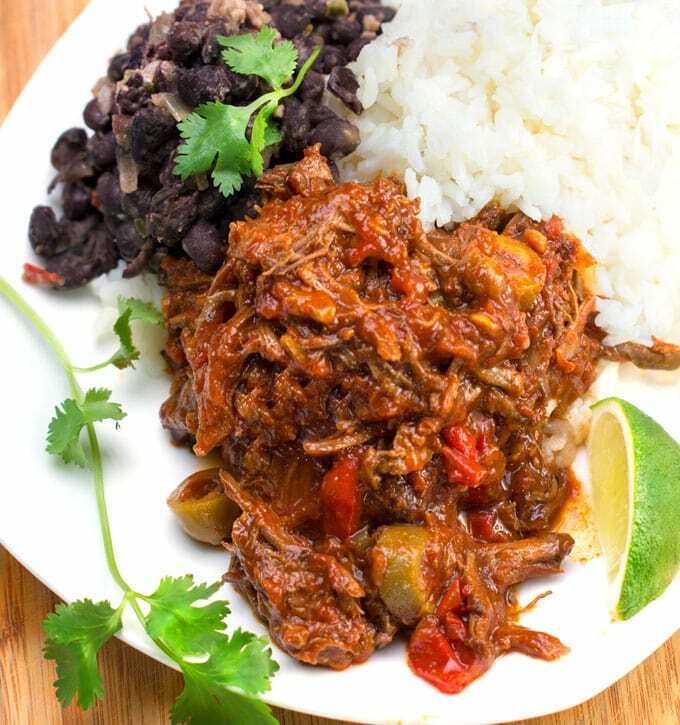 I hope you enjoy the ropa vieja! Let me know.